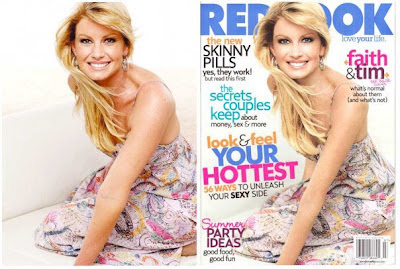 Balancing Jane: #KeepItReal: Are Magazines Here for Us or Advertisers? 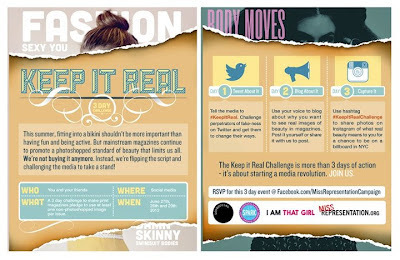 #KeepItReal: Are Magazines Here for Us or Advertisers? Yesterday marked the beginning of a three-day campaign challenging magazines to #KeepItReal by promising to print one unaltered photo an issue. No photoshop, no "tweaking,"just real people representing real bodies. Because media impacts the way that we think about the world around us. When all of the images of culturally-defined "beauty" that we see around us are altered, we begin to internalize a body image that is (literally) unattainable. No one can look like those models, not even the models themselves. While this is disturbing enough for grown men and women who are now holding themselves up to unrealistic ideals, it's even worse for kids, especially young girls. Young girls are getting the message loud and clear that their bodies are their enemies. They're dieting at younger and younger ages and obsessing over every "imperfection" on their bodies at a time when they should be free to develop a strong sense of identity and self-worth. Some people will counter that this has always been the case. And it's true that young people have looked up to celebrities and models for generations, but the Photoshop era has brought in a new twist. While before the celebrated bodies were often only representative of a small segment of the population, now the photos are representative of no one. What's the Point of Media? I also think that this campaign brings up issues surrounding the purpose of media. Is media a reflection of its audience or is media designed to control that audience? This campaign was sparked by a teenage girl's Change.org petition asking Seventeen magazine to promise to run one unaltered photo per issue. She took her signatures (which have now reached more than 80,000) to the magazine, but they didn't agree. Why? Print media is struggling to keep up with new forms of online entertainment. Why wouldn't Seventeen want the positive association with pleasing a large subsection of its readership? And it's not as if this request is to stop using Photoshop at all. This is a request for one unaltered photo. Can that really be that disrupting? Perhaps it can. I think that part of the reason so few magazines are willing to get on board with this campaign--even in the face of so many readers who are obviously supporting it--that there's something deeper going on. Magazines get money from their subscriptions and readers, sure, but they also get money from advertisers. Most of these magazines, which are primarily aimed at women, are bolstered by advertisements from the beauty industry. The beauty industry needs you to feel flawed. No one is going to go spend hundreds of dollars on ridiculous things like prescription medication to lengthen their eyelashes or even just expensive cosmetics if they feel that there is nothing wrong with their actual bodies. The more flawed we feel we are, the more money we're going to spend to make up for it. But the industry--like all industries--has been pressured to grow. Leveraging new advertising strategies, as this infographic demonstrates, the beauty industry has grown to $59 billion. These numbers don't even include all of the weight loss and "diet" food markets that benefit from showing people that their bodies are unacceptable. I'm not saying that every dollar we have needs to go to building health clinics or that we can't spend any money on individual things that we want for ourselves, but I am saying that we should take a step back and think about what "wanting" those things really means. Think about it. It's bad enough to be constantly comparing ourselves to models who have professional make-up and personal trainers and the financial resources to buy the best-fitting clothes. That alone is likely to make us see "flaws" in ourselves that aren't actually flaws. But when we're comparing ourselves to images that aren't even of real people, we can't win. There is no amount of money we can spend to look like a living version of a Photoshopped image. There's not even an amount of money that the actual models can spend. These images are not real. We're being sold a lie. And we pay for it dearly. We have to demand better for ourselves. Yes, magazines exist to make a profit, and yes, showing us unattainable images of "beauty" in order to make us feel flawed is a great way to sell more advertising slots to make up companies and diet pill manufacturers. So we have to hold them accountable. Media does shape us, but we shape media, too. If we demand diverse representation (and this goes beyond body image--many of these magazines show very few images of women of color, and those that do often "whitewash" them to lighten their skin and hair), then we can start to change the way that this power differential operates. We don't have to be at the manipulative whim of a beauty industry that profits off of our insecurities. And that doesn't mean that we can't ever buy make up or cute clothes; it just means that we have the right (and the responsibility) to demand respect from these companies and our media. They are both, after all, a reflection of ourselves. So please, join the #KeepItReal campaign and demand better for ourselves and for our future.